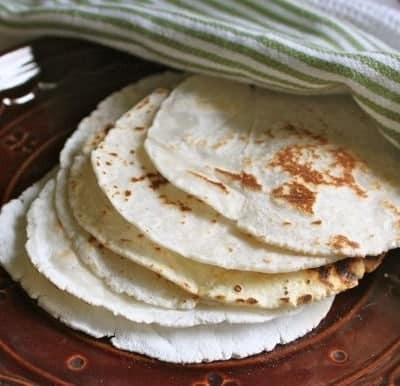 If you want easy and delicious gluten-free recipes, you’re in the right place! 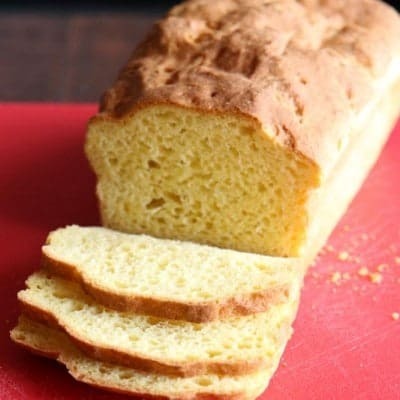 At GlutenFreeBaking.com, we love easy recipes that work. Not only are the recipes here gluten-free, many are also dairy-free, egg-free, nut-free, soy-free, and grain-free (paleo). If you eat gluten-free, whether because of celiac disease, a gluten intolerance, or because you just feel better on the diet, you are welcome here! Hi! I’m Elizabeth. (waves) And I love to bake! 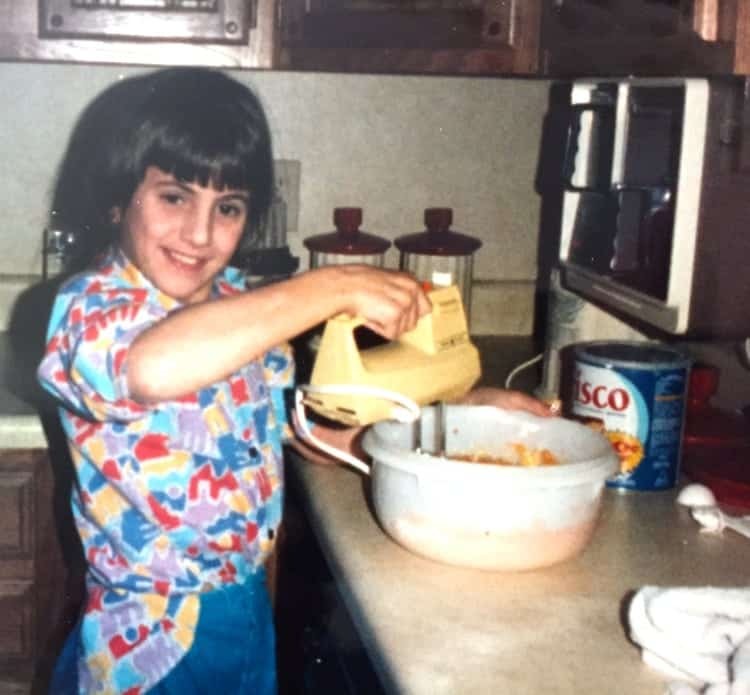 I’ve loved baking since I was a kid. Look at that smile! And that can of Crisco! And that BRIGHT untucked shirt. At least I look happy! How about that bread? (whispers) It is just me or does it look a little…burnt? And, yes, I’m totally in my pajamas. Baking in my pajamas! That’s something I’ve never outgrown! Allergies: I’ve lived with severe food allergies all my life. I experience anaphylactic reactions to tree nuts, sesame, and soy*. I have oral allergy syndrome, including itchy hands when peeling carrots and potatoes, to a variety of raw fruits and vegetables. *Because allergies are WEIRD, I’m able to eat soy oil, soy sauce, and soy lecithin with no problem. Like I said, weird, right? I’m not alone, others with soy allergies are able to tolerate these foods. So you’ll find recipes that use soy oil and gluten-free soy sauce on the site. In fact, I can’t imagine my fridge without a big ‘ol bottle of tamari. However, just because my body does well with these versions of soy, doesn’t mean yours will. Check with your doctor! Here’s more information about the topic of soy sauce and allergies. Education: I’m a graduate of the Culinary Institute of America. My degree is in baking and pastry arts. That means, I’ve made 50 pound batches of bread, pulled and blown sugar, tempered chocolate, and made more pastries than I can count. Let me tell you, it was a hoot! I loved my time there! Cake: My wedding cake was over six feet tall. Yes. Not kidding. I need to share this fact with you because…my wedding cake was over six feet tall. You’d tell people about that too! 😉 Of course, my wedding cake was gluten-free, nut-free, and soy-free. It was also six feet tall. Have I mentioned that? 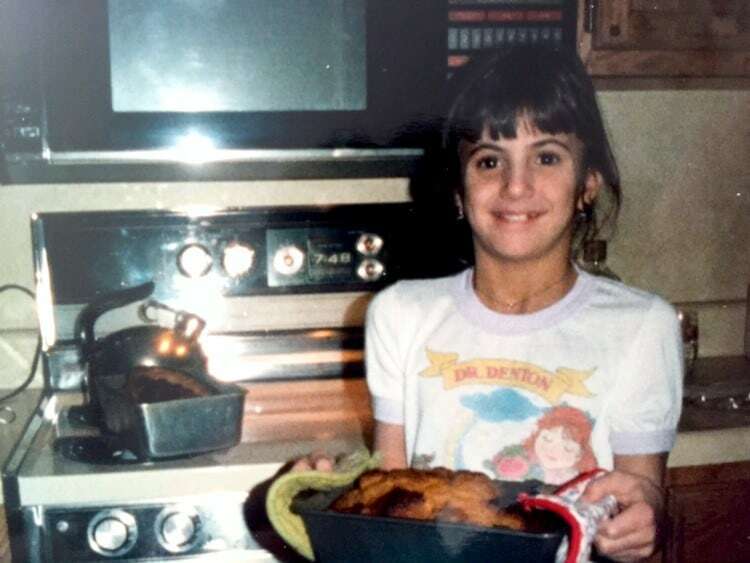 Celiac Disease: As an adult, I was diagnosed with celiac disease. This was after completing my studies at the CIA. Everything made sense. I felt so much better after going gluten-free! “Judgment-free baking space?” What’s that about? It means I’m 100% okay with from-scratch baking. And I’m 100% okay with using mixes and other convenience products. 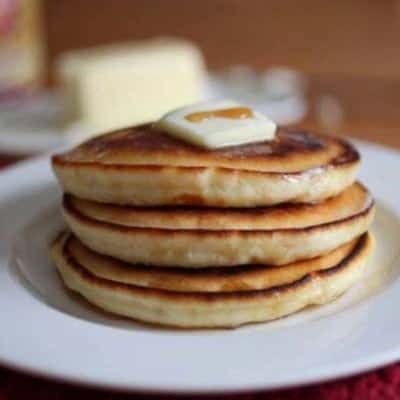 At GlutenFreeBaking.com, you’ll find a blend of from-scratch recipes and shortcut recipes. I love easy baking and I’m not ashamed of it. Will you convert a recipe for me? Maybe! The fact is that I really, really want to! But I’m also busy. Please send your recipe along and I’ll be in touch about converting it. Why is your third book a paleo book? 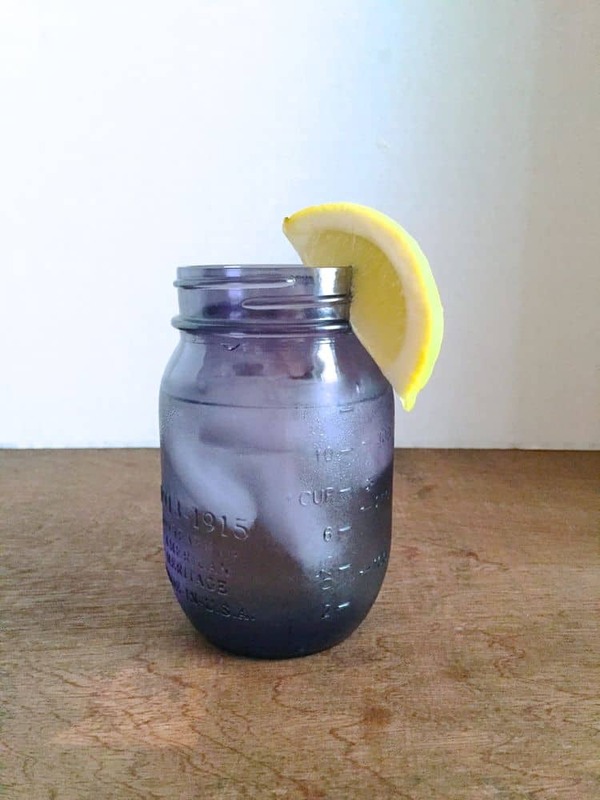 Do you follow a paleo-diet? I don’t follow a paleo diet. BUT (keep reading!) over the last few years, I received a TON of requests for grain-free recipes. I thought it would be a fun project to tackle. My publisher was interested in the idea and, boom, I wrote a book. I made one of your recipes and it flopped. I hate you. Okay. Did you follow the recipe as written? Well, I added one cup of roasted peaches, omitted the bananas, used melted coconut oil instead of butter, possibly forgot the baking powder, and baked it 20 minutes longer than directed. So, yes, I totally followed your recipe as written for banana bread. Here’s the deal: all baking is somewhat finicky. Gluten-free baking is even more finicky. And grain-free baking is the touchiest. I test and re-test all my recipes. If it didn’t work for you, perhaps you forgot an ingredient or miscalled something? Maybe an ingredient substitution didn’t work. Or maybe there’s a typo in the recipe. I’ll do my best to help you get to the bottom of it. Do you teach baking classes? Didn’t you once write a print newsletter? OMG. I did! I totally did! 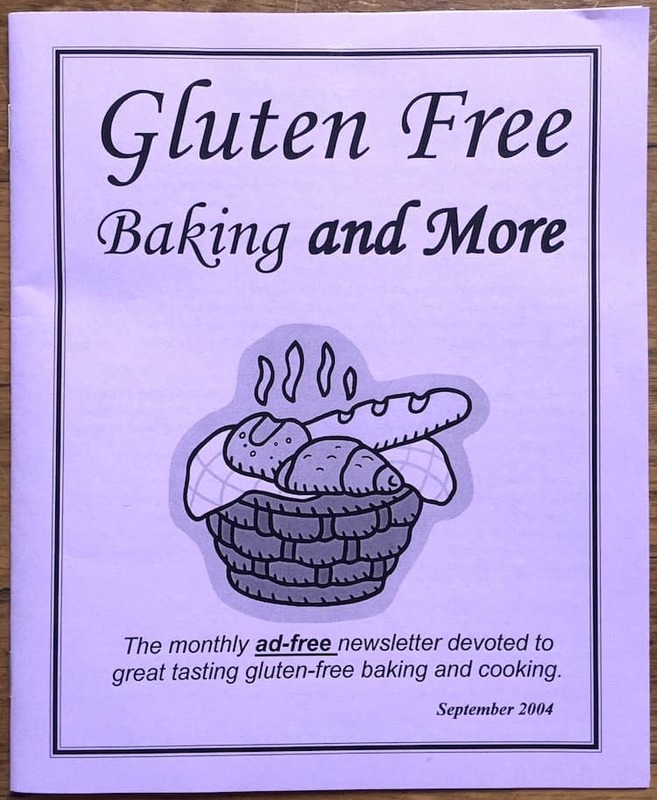 Waaaaaaaay back in 2003, I wrote and distributed “Gluten-Free Baking and More”. 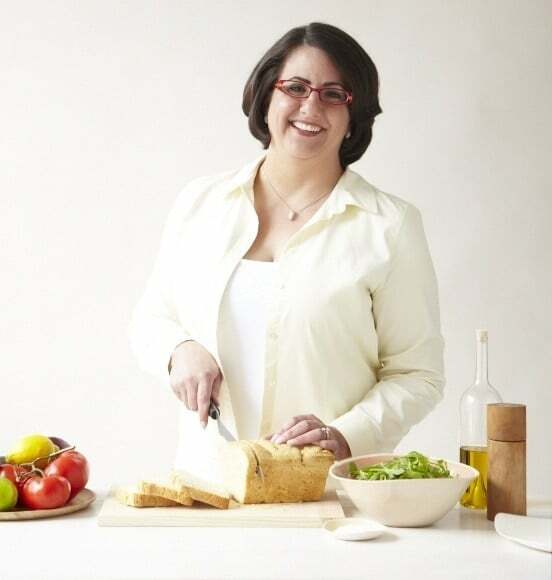 Here’s how the whole shebang went down: I started teaching gluten-free baking classes. Those classes were so popular that students began requesting recipes from me. I wanted a way to connect to those students. So I started a little purple print newsletter. I sold lots of those newsletter. Then postage went up and running a print newsletter was no longer feasible for me. I moved online. My journey to food blogging has been bumpy. Thankfully, the bumpy road is now behind me and I run this lovely site. 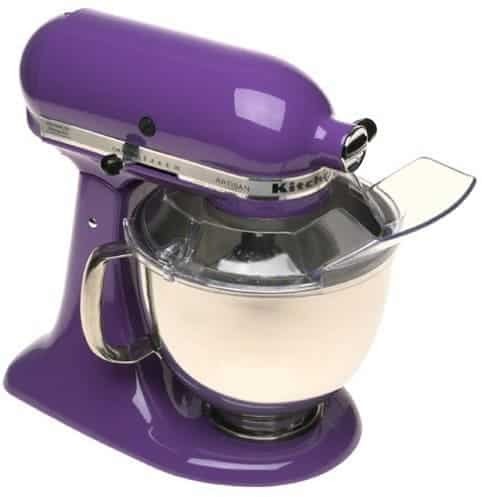 I have a purple cookbook. 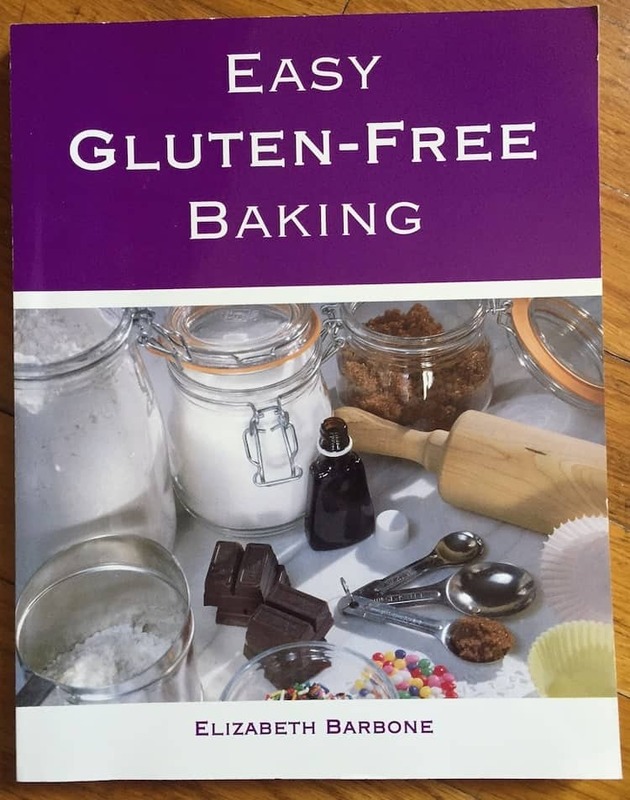 It’s called “Easy Gluten-Free Baking” and has your name on it but doesn’t look like the book you have pictured on this site. What’s the deal with that? Aw! You have my firstborn cookbook! Not only did I write a print newsletter, I also self-published a cookbook. Now this was way, way before self-publishing was cool. In fact, it was looked down upon. Easy Gluten-Free Baking did so well that it needed a new home. I could no longer send out books, manage accounts, AND create new recipes. Lake Isle Press picked up the title and republished it—along with gorgeous pictures taken by Tina Rupp and a new chapter called “Tastes Like” which included gluten-free recipes for beloved name-brand classics. 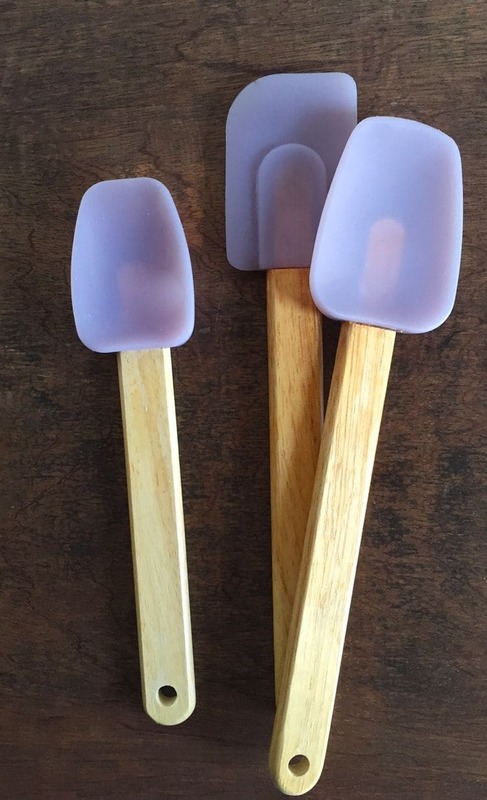 Do you love the color purple? Um, I don’t know why you say that. I mean. 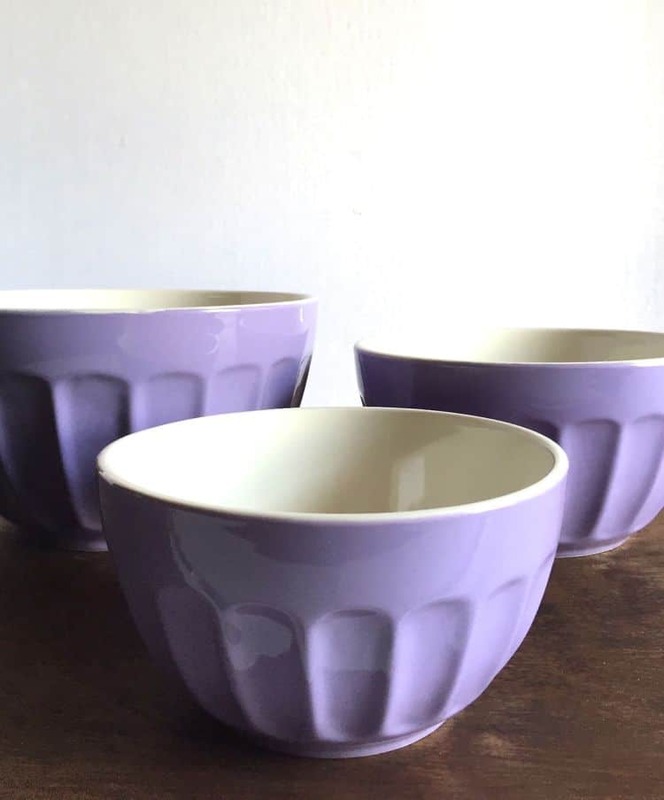 Here are some of my mixing bowls. 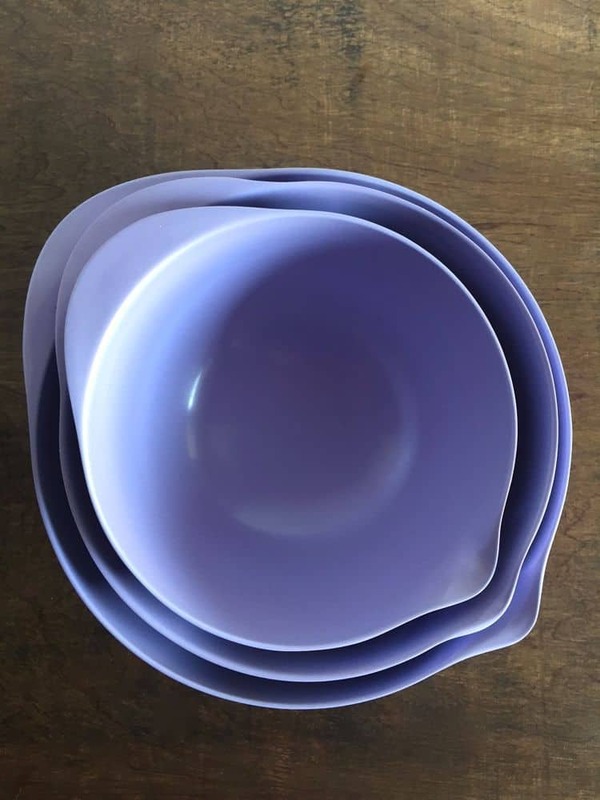 More of my mixing bowls. Oh. And the glass I’m drinking from right now. So, yeah, it’s weird that you think I like purple. I have no idea where you got that crazy idea!